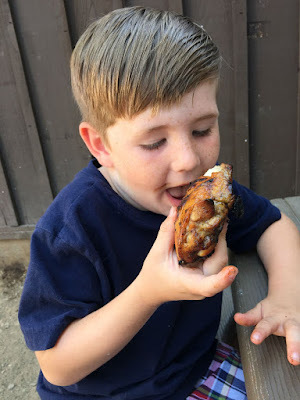 Lunchbox Dad: A Celebrity Chef Gave Me This BBQ Recipe and My Family Devoured It! A Celebrity Chef Gave Me This BBQ Recipe and My Family Devoured It! Disclosure: This is a sponsored post partnering with National Honey Board. I received compensation but all opinions expressed are solely my own. Have you ever discovered a recipe that was so good you kicked yourself for not finding it sooner? Yeah, I thought so. I recently had a chance to talk with celebrity chef, cookbook author, and TV host and National Honey Board spokesperson David Guas about BBQ and fatherhood. I learned some great tips about cooking and came away with a tasty recipe for Honey Five-Spiced Chicken Thighs. 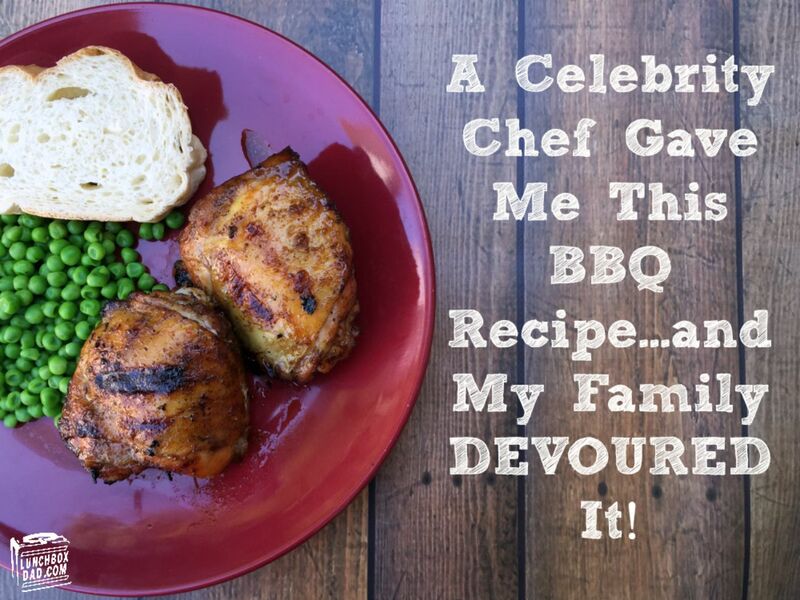 Read all about the exciting things happening with Chef Guas and then check out my family's new favorite BBQ chicken recipe! In the past few years you've written a book, opened a second restaurant, and been the host of American Grilled on the Travel Channel. What have been some of your favorite recent experiences? "Opening a second restaurant is something that I've been working on for 2 1/2 years and it finally became a reality when we unlocked the doors May 12. My second cookbook Grill Nation just came out in May and it was a lot of fun to work on that." You wrote your first award-winning book on desserts. Your second book and TV show is about grilling. How did you go from desserts to grilling, what is the connection? "I call myself the "Accidental Pastry Chef." Coming out of school I took whatever job was available and that happened to be in the pastry department. I fell into that. Later on I wanted to get back to more casual food. Grilling was what my dad did growing up and I was always his helper. He was the one who passed the passion of grilling on to me at a young age." You talk about your dad's influence on you. My daughter loves to cook and took some classes this summer. Do you have any advice for kids who want to learn more about being a chef? "I have an 11 and a 13 year old. I make a family day out of going to visit a pig farm, a heritage breed turkey farm, or going to collect eggs. I want them to know that milk doesn't come from a grocery store, it comes from a cow. Both of my kids have put on full suits and been in bee hives to watch the whole process of honey extraction. I think there is a great opportunity where kids can put their hands on things and see the process. It's about a bigger picture of having respect for all living things." I have been playing around with some BBQ recipes this summer and have had fun using honey in those recipes. What are some tips that you have for people looking to up their BBQ game? "I use honey in sauces for basting and brining to balance out high acid sauces like a tomato based BBQ sauce. I use darker honey to take the place of other sweeteners in those sauces. You get a darker, richer, more flavorful sauce. Grilling is high and fast heat. Make sure and zone your grill. Turn three burners on as opposed to all four so you have different temperatures. The same with charcoal. People sometimes forget about indirect heat. By using indirect heat you aren't going to burn the meat or scorch it. You can also use this safe zone to remove the meat if there are flare ups or you need to get it off the grill if kids are crying, or you need to handle something else for a few minutes. This gives you flexibility. Also, if you are a beginner start with a dome kettle grill. Don't get something with all the bells and whistles right away. Get what makes sense for you. If gas is more convenient then get a gas grill. Teach your kids about grilling as well. My kids ask questions and I let them get hands on in the process." I've been using honey.com quite a bit because of all the great recipes on there. Do you have an easy BBQ dish that you recommend for families? 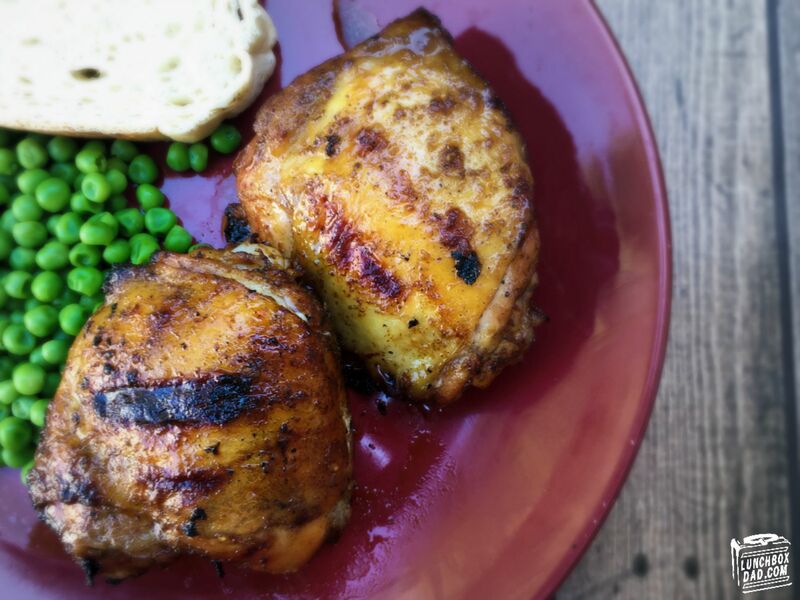 "There is a Honey Five-Spiced Thighs chicken recipe that uses buckwheat honey that I initially seared but I have also done the same recipe on the grill. It's on honey.com and also has a how-to video you can watch as well." Lastly, I have to ask, who makes the school lunches in your family? "My kids have never bought school lunches. I have made numerous lunches for my kids however with my work schedule I leave very early in the morning for my work so my wife makes 90% of their lunches...with some coaching from yours truly of course! One my kids' favorite treats are honey sticks. They are only a teaspoon but they are a great snack to help give energy later in the day at school. They love these." In my interview with Chef Guas, he pointed me to his chicken thigh recipe and video on honey.com. His family loves this and he said it can easily be made in the kitchen, or out on the BBQ. I took the challenge and my family loved how the chicken came out. I guess the chef knows what he's talking about! Go to honey.com for the ingredient list and watch Chef Guas in a short video tutorial below showing how to make this in the oven. Also, the directions are below for how I made these on the BBQ. 1. In a shallow dish, combine the honey, orange zest, orange juice, olive oil, five-spice powder, garlic and salt. Toss the chicken thighs in the marinade, taking care not to pull away the skin. Cover and refrigerate for one hour. Preheat the BBQ to 350 degrees. 2. Place skin side down on hot grill for 2-3 minutes. Watch for flare ups and move thighs if these occur. Don't allow the skin to get burnt. 3. Flip thighs over so skin side is up and grill for 18-20 minutes. Check regularly and remove when internal temperature reaches 165 degrees. 4. Remove and cover loosely with foil. Allow chicken to rest for 5 minutes. Serve and enjoy! Remember to visit honey.com for even more great recipes and how-to videos using honey, which is one of Chef David Guas' favorite natural sweeteners!